7 Ways To Help Heal From A Binge - Welcome to SarahKesseli.com! Slip ups happen every now and again. And during the holiday season our chances of binging increase even more. Perhaps it was a few more cookies than you would like to have eaten, a pint of ice cream after a hard day, extra pie from all of your holiday stress, or a full-blown, uncontrollable binge. It happens to all of us. The key is knowing how to bounce back and support your body both mentally and physically. 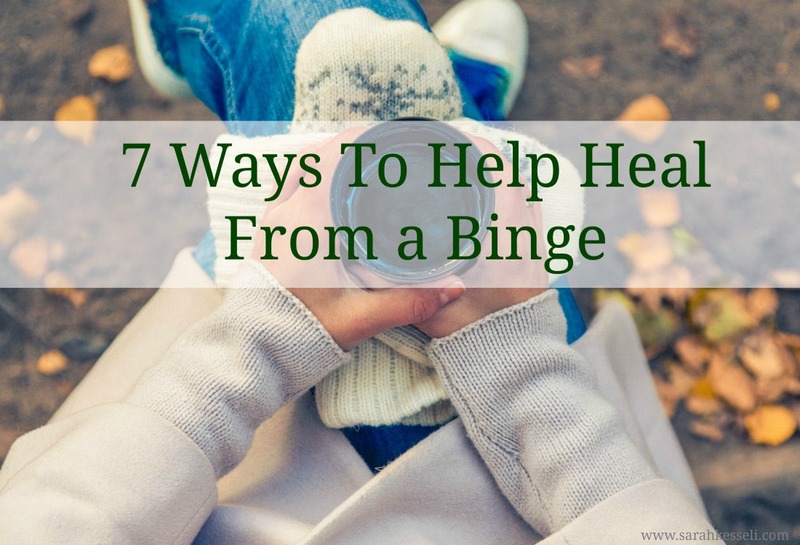 Start with these 7 Ways To Help Heal From A Binge. Stressing and putting yourself down is not the way to go. One binge will not make you gain weight. Take a deep breath and focus on making positive choices going forward! 2. Stay away from the scale. In most cases, you are retaining excess water from the salt and carbs you ate. Stepping on the scale will give you an inflated reading and cause more stress. Give your body at least 3-4 days to recover (or more depending on the size of the binge). 3. Start with a big glass of water. The best way to help your body digest what it has just taken in is with a big glass of water. Shoot for 100oz+ the next day, depending on your age, weight and activity level. 4. Eat a balanced meal of protein, carbs, and healthy fats. The day after a binge we are usually not hungry. But, the worst thing we can do is try to ‘make-up’ for the calories we ate the day before. Even if you have no appetite have a small, balanced meal the next morning to get your metabolism going again. 5. Increase your veggie and fruit consumption. Not only will your body need lots of vitamins and minerals to replace what was lost during the binge, but it will also need the fiber (and water) to help digest the food you ate. 6. Sneak in some movement. Exercise is usually the last thing we want to do after a binge. Understandably, we are feeling sluggish, tired and unmotivated. But taking a brisk walk, doing some yoga or even a light weight lifting video at home will help increase your endorphins (the ‘feel-good’ chemicals) which reduce stress, pain, and inflammation. We all have slip ups now and again. Take a step back, think about why it may have happened, remember how you felt after the binge and use that information to help you move on. We can’t change the past, but we can focus on making better choices in the future. Talk to me! Have you ever experienced a binge before? How did you help reset yourself? Do you have any other great tips to get back into feeling like yourself again?